Wendys World: "LATE LATE LATE"
And the words go like this "One out of Three ant Bad"
MEANWHILE in Wendy's World I have been to Perth here in Australia, off to the USA, over to England, and few other trips here and there to drop some little thank yous to all of you, so if you haven't heard from me yet! Well as they say tomorrow is another Day my friends. The most beautiful Shane in the Whole World was so excited today as he was blessed with some new "Babies" well that's what he called them, Ya just gotta love him! they are really called, of course just between you and me girlfriends, "ORCHIDS" now this bit is very important, he has been growing this ONE yes One plant for TWO YEARS, OK and this is the very first time it has flowered, and flower it did, it is really beautiful, and if I was a great blogger I would send you all a wee little photo, so maybe you should put your hands together in the praying position and say a prayer that it doesn't take me TWO Years to show you the photo!LOL not!! This is where you tell me it does get easier!! JOLLY JUMBO JETS WHAT A WOMAN!!! Though it did turn out at the top of the page LOL just a small detail really!! Well their you have it Shane's babies!! You know what?? I'm going to do that again, again and again just cause I can!! 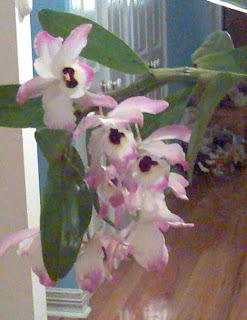 Well no wonder Shanes excited, thats one pretty perfect Orchid. You are not alone in the 'jumping out of bed to go to your blog' department. I do it quite often! Sometimes you just gotta!